During a live radio interview today on Radio France Culture (info / listen), the host Sylvain Kahn put me on the spot, asking whether, as an Australian geographer I thought that French geography was missing out on the environment question. I deflected the question, not feeling qualified to judge an entire disciplinary tradition I have only partial exposure to. But as far as I understand from my conversations with French geographers, his question was not innocent. According to them, there are surprising tendencies of much French geography towards (1) climate skepticism, as illustrated by the book Le ciel ne va pas nous tomber sur la tête, ranging from hard-core denial of climate change, to assertions that humans should focus on adaptation (as in, “we’ve adapted before, we can continue status quo with our lives on this planet and we’ll adapt again”), to (2) a conservative tradition of describing romanticised regional agricultural landscapes where centuries of interactions of people with their environment culminating – in the sarcastic eyes of my interlocutors – in regional artisanal specialties like saucisson, camembert, and vin, and (3) a fundamentally apolitical approach to understanding human-environment relations. But things are never as simple as that. There are plenty of other voices. Indeed, the inspiration for Kahn’s interview was a conference beginning tomorrow at the Université d’Orléans, entitled “Géographie, écologie, politique : un climat de changement” (conference website here). The conference organisers Denis Chartier and Estienne Rodary (both editors of the journal Écologie et Politique) position the event directly as a challenge to, or questioning of, the apolitical and skeptical approaches above. This parallels a flourishing of interest in France in the anglophone tradition of “political ecology” as a research approach. 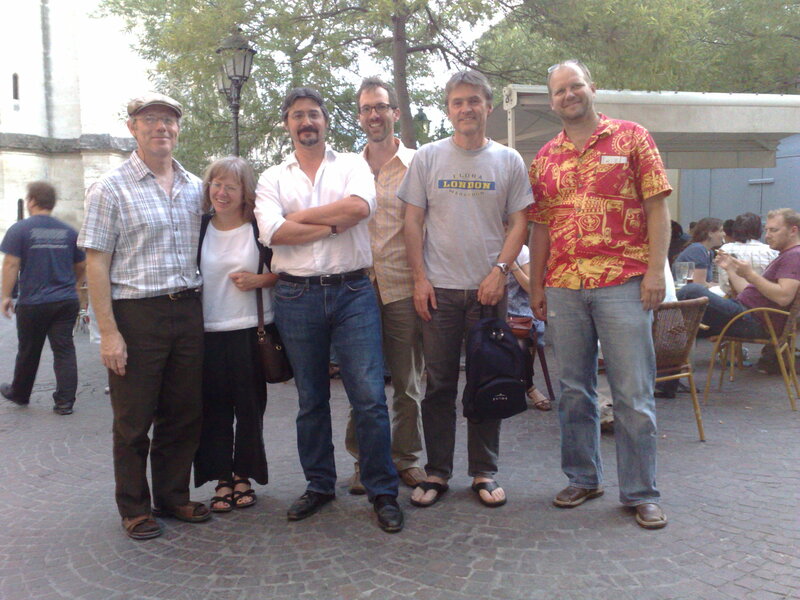 In 2009, for example, a number of key figures in the discipline (Tom Bassett, Nancy Peluso, Paul Robbins, Tor Benjaminsen) were invited to spend a month workshopping with interested French researchers (see link, photo below). That event was emblematic of an increasing traffic of influence between anglophone and francophone geography, though currently the traffic is largely one-way (French human geographers reading the Anglophone literature and feeling more and more pressure to publish in international – hence Anglophone – journals) . Anglophone human geography tends to only read (and fetishize) French theorists like Rancière, Lacan, Lefevre, Foucault. Then again if the above accusations by my colleagues about mainstream French geography are true, this might be understandable! In any case reading scholarly work in different languages is not easy, and I do not envy anyone who has to work outside their language(s) of comfort. Juliet Fall, who is an excellent bridge-builder between French language and English language geography, makes a good point in her latest article. She says it is “unrealistic and somewhat self-serving to suggest that everyone should read widely in other languages. Instead of making this a requirement for all… perhaps individuals who read other languages have a responsibility for sharing the debates they encounter, and concurrently, and most importantly, others have a responsibility for publishing and making such diverse voices available.” So, in my contribution at the conference tomorrow, co-written with Simon Batterbury, I will point out (to the French audience) two key moments when Anglophone geography injured its otherwise strong society-environment tradition – once around 1970, when the quantitative revolution and human-physical divisions meant the discipline was largely absent from the development of “environmental studies” (Michael Watts comments on this moment in this interview), and second in the 1990-2000s with some of the excesses of the nature-culture debates and deconstructionism (mea culpa too). Perhaps, this will inspire. And, in turn, this blog translates certain elements of the French debate back to an Anglophone audience. This entry was posted on Thursday, September 6th, 2012 at 8:37 am and is filed under Research. You can follow any responses to this entry through the RSS 2.0 feed. You can leave a response, or trackback from your own site. Here’s a really good book chapter on “Ecologie politique” and the interactions of French and Anglophone academia. Chartier, D & E Rodary (2015) Globalizing French écologie politique: a political necessity. In The International Handbook of Political Ecology, edited by Bryant, RL. Cheltenham: Edward Elgar, 547-560.